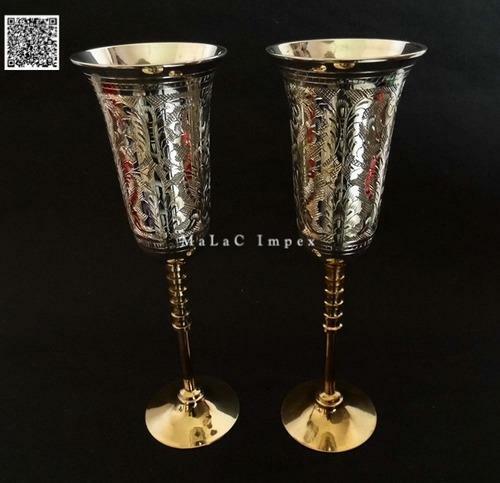 Gift Wine Glass Gold and Silver Plated Goblet- You will start to love them for sure! Made from quality brass and plated with gold/silver, these beautiful hand carved bowls, once placed on the table, fill the space with the unique aura of pleasing charm. Malac Impex has been providing innovative handmade art metalwares to beautify the home & life since 2008. These handmade goods are the mark of excellent creativity and tools as signs of art making which have meaning i.e. expression and interaction of shape with type of material with the way of crafting. Our skillful and creative team of artisans gives their best to present a creative feel to the collection of products we offer. We give regular trainings to the artisans to let them understand the scenario of today's world market. As a result, with their innovation, inspiration and productive efforts, the company has earned a reliable name within the market. And more over to serve better to our foreign customers, we always try to provide the commodities that not only match the premium quality but also meet the legislation of the importing nation. We understand that the import legislation varies from nation to nation thus, we are flexible in using different base and finishing material without sacrificing the durability and aesthetic value of the product.